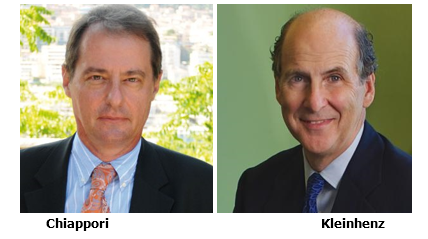 Pierre-André Chiappori and Jack Kleinhenz were elected to the NBER Board of Directors at the board’s September 2015 meeting. Chiappori is the E. Rowan and Barbara Steinschneider Professor of Economics at Columbia University, where he has taught since 2004. He will serve as the representative of Columbia University. Chiaporri’s research focuses on household behavior, risk, insurance and contract theory, general equilibrium and mathematical economics. Chiappori, who received his Ph.D. in economics from the University Paris 1, is a fellow of the Becker-Friedman Institute at the University of Chicago, the Econometric Society, the European Economic Association, and the Society of Labor Economists. Kleinhenz will serve as the representative of the National Association for Business Economics, an association of which he is the past president. He is the chief economist for the National Retail Federation and the principal and chief economist of Kleinhenz & Associates, a registered investment advisory firm specializing in economic consulting and wealth management. Kleinhenz also is an adjunct professor of economics at Case Western Reserve University’s Weatherhead School of Management. Formerly with the Federal Reserve Bank of Cleveland and the Federal Home Loan Bank of Pittsburgh, he is a current member of the Governor of Ohio’s Council of Economic Advisors. Kleinhenz received his Ph.D. in economics from the University of Notre Dame. The Board of Directors is the NBER’s governing body. It includes representatives of many U.S. research universities and national economics organizations, as well as business and labor leaders. The NBER is the nation’s leading nonprofit economic research organization. Twenty-four Nobel Prize winners in Economics and thirteen past chairs of the President’s Council of Economic Advisers have been researchers at the NBER. The NBER is supported by research grants from government agencies and private foundations, by investment income, and by contributions from individuals and corporations.